A demolition permit application was applied for on January 31st for the Castle Ballroom at the corner of Olive Street and T. E. Huntley (formerly known as Ewing). The buildings roof suffered a partial collapse in November of last year when one of the large timber trusses that spanned the ballroom space failed. 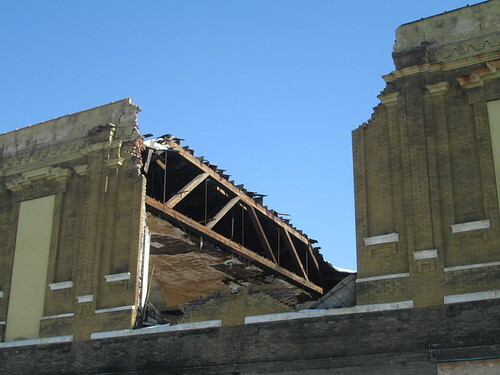 The truss failure caused two bays of the roof to collapse and as it fell, the truss pushed out a portion of the west wall causing it to fall outward. The Building Division issued an emergency condemnation on November 18th, 2013. While the damage may look devastating, a partial collapse such as this should not automatically mean the end of this building. The damage is quite repairable, affecting a small percentage of the facade and of the overall building structure. Many buildings have been rehabilitated with similar or even worse conditions including the M-Lofts, the Lister Building, the Polar Wave building and many more. The cost of demolition, estimated at $50,000 would likely be comparable to the cost of re-building the collapsed portion, and when completed, the owner still retains a valuable asset instead of a vacant lot. 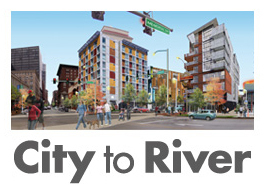 If incorporated into an overall rehabilitation project, the re-building costs would also be tax credit eligible. 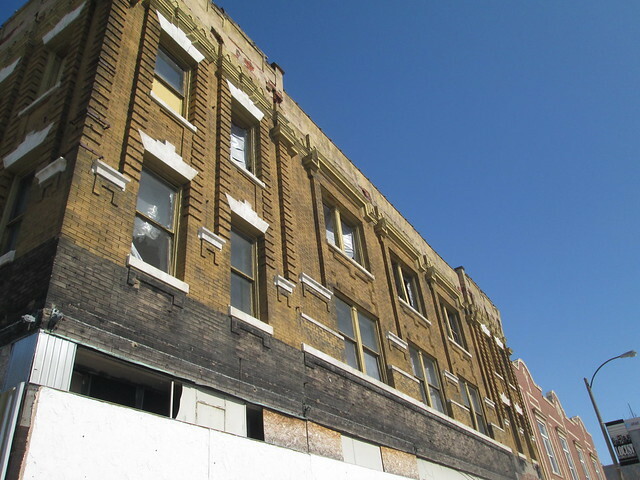 The building was placed on the National Register on in March 2011 by the owners, SAG Properties, to make the building more attractive for rehabilitation with the use of Historic Tax Credits. Photos above and below are from the nomination. 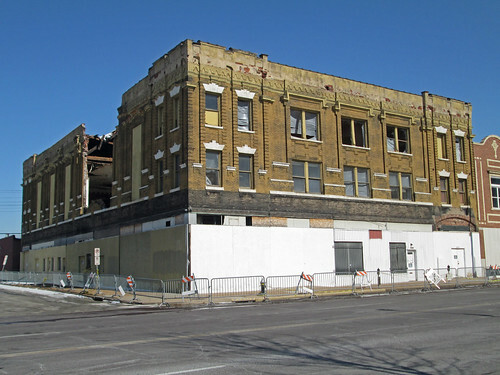 Although the building is listed on the National Register, the Cultural Resources Office confirmed that they will have no jurisdiction over the proposed demolition because of the emergency condemnation. 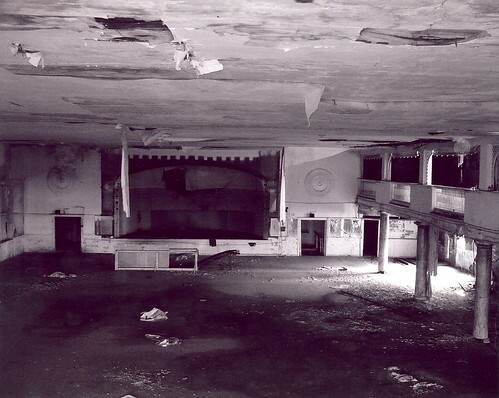 An interior view of the ballroom from the rear balcony shows that the interior features of the space were largely intact before the collapse. 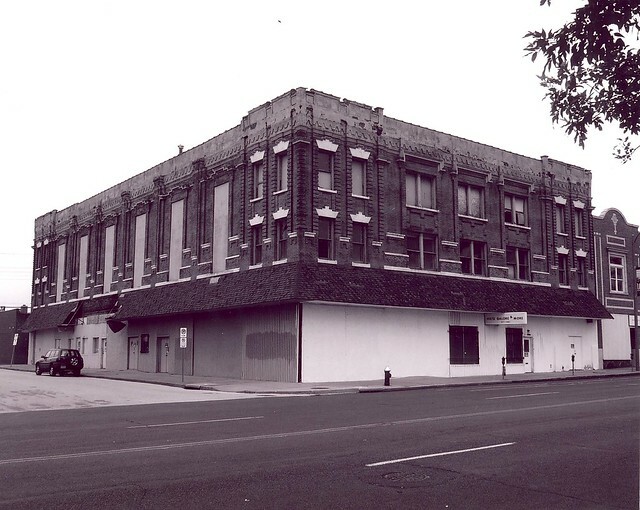 The building was constructed in 1908 as "Cave Hall" in a Renaissance revival style with rusticated pilasters of brick with bold detailing above the window heads and near the top of the pilasters executed in sheet metal. The brick was long ago painted an ocher yellow color, but was originally tan colored. 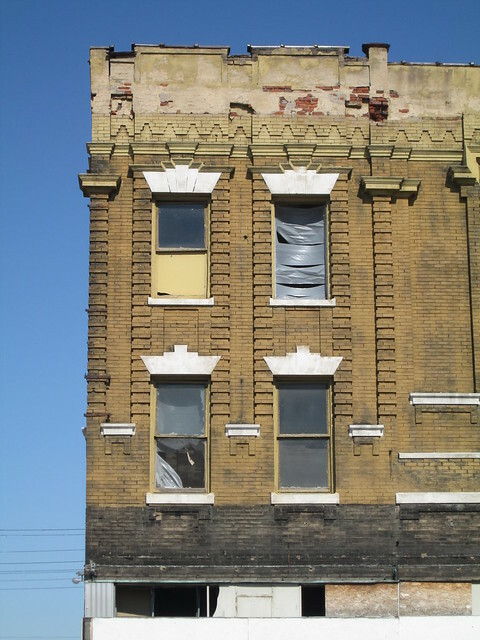 The removal of a bad mansard that had been installed over the storefronts reveals the original color, which was heavily soiled from pollution. The decorative brick and sheet metal work give the street elevations a great amount of depth on what would otherwise be fairly flat facades. The loss of this building on a stretch of Olive that has been so depleted will be awful, especially considering how many buildings in the Midtown Alley area have been renovated in the last several years. I found out about the demolition application in a roundabout way. A little over a week ago I saw a post on Facebook mentioning that a demolition permit had been applied for on yet another building in Grand Center at 3829 Olive. The application had been listed on Lewis Reed's Demolition Docket page as applied for by SAG Properties on January 31st. 3829 Olive is a vacant lot that the City's property database shows is owned by Grand Center, Inc. 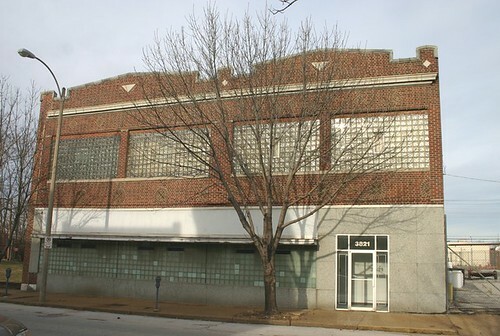 I figured maybe the application was for this building immediately east at 3821 Olive, also owned by Grand Center, Inc. While it wouldn't be the first needless demolition in Grand Center, but it still didn't make sense. On a hunch that the address had been wrong, I checked the Castle Ballroom on the City's property database and sure enough found the demolition permit application dated January 31st. The address for the Castle Ballroom is 2839 Olive. It seems that another clerical error at the Building Division resulted in the address numbers being transposed. The Docket page has been updated with the correct address. They get their information directly from the Building Division, only correcting blatantly obvious mistakes such as street name mis-spellings, which are apparently fairly common.